Below are some of the world's best resin kit manufacturers. There are also some non-resin companies that do resin kits too. Our list will be growing as our site expands. If you know of someone that should be on this list, please let us know! Just click on any of the above web sites to contact the manufacturer. Resin companies are usually small, in-house operations that really need your support. Each purchase you make from them helps to insure the continued existance of our hobby. Here we have the Commonwealth Aircraft Corporation (CAC) CA-23 Ceres (demoness), an Australian aircraft proposal from just after WWII. A supersonic, all-weather interceptor capable of Mach 1.5 with a two-man crew and powered by two Rolls-Royce RA.1 Avon axial-flow turbojets. A promising project reaching mock-up and component parts stage before cancellation. The Australian Air Ministry decided that the Australian built North American F-86 Avon Sabre was a more economical choice. The only kit avialable in 1/72, or any other scale, comes from Uncle Les Models of Australia. The kit is molded in solid resin with separate detail parts, a vacuform canopy and optional metal landing gear. Quite an accomplishment when completed! This one is finished in the post-war, radiation deflecting paint scheme. Soon we will be offering a search-service to help you find that elusive kit you have heard about, dreamed of, but just cannot find! Perhaps we can even get your desired kit on the market if it does not yet exist. So far we have helped bring at least five kits to production! 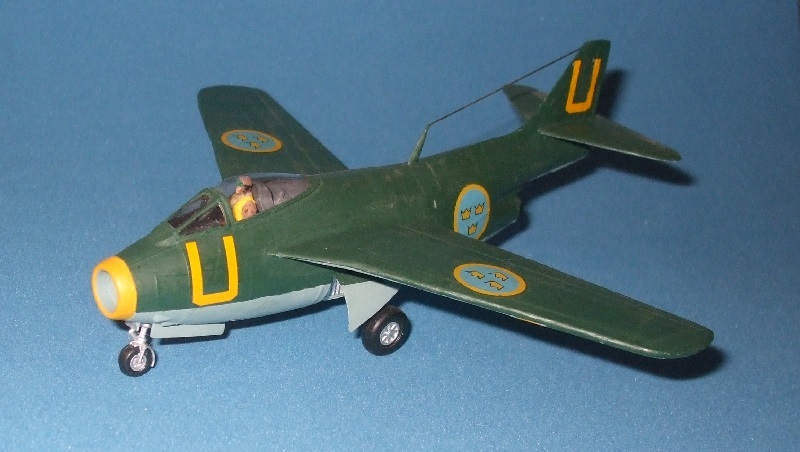 This is the Saab J-29A Tunnan (barrel) prototype, Sweden's second jet fighter. Unlike the Saab J-21R, this aircraft was originally designed as a turbojet interceptor. Powered by a Swedish RM-2, a licensed built DeHavilland Ghost 45, centrifuge turbojet, the Tunnan protected the skies of Sweden until well into the 1960s. The J-29 also served with the United Nations during the Congo Crisis flying in U.N. colors and camouflage for Africa. The J-29 has been modelled by many companies in 1/72 including plastic versions by Matchbox and Heller, and in resin by the International Plastic Modelers Society of Austria and currently TARANGUS.